On-loan Chelsea star Reece James turned down the chance to leave Wigan Athletic for high-flying Championship and Premier League clubs during the January transfer window. The 19-year-old’s season-long deal at the DW included the opportunity to return to Stamford Bridge halfway through and be sent elsewhere. But Latics Paul Cook says the fact he chose to stay at Wigan says everything about him as a player and a person. “This was a lad who, over Christmas time, had every Championship club, Premier League club, everybody, after him,” revealed Cook. “And he chose to stay at Wigan Athletic for the rest of the season. “He could have gone anywhere - to one of the big teams in the Championship to try and get promoted. “But he didn’t, and that just sums him up – he’s man outstanding player, who trains hard every day, and doesn’t cause you an ounce of trouble. “He’s going to go on and have such an outstanding career at the highest level - I think he could play at that level now. Cook also acknowledged the starlet had far exceeded expectations since arriving last summer without a single first-team appearance to his name. “Nathan Byrne was our player of the year last season, he was absolutely outstanding for us,” Cook said. Speaking at the club’s fans forum at the DW Stadium, Cook also revealed Latics were unsuccessful with two seven-figure offers in January that would have bolstered the club further. 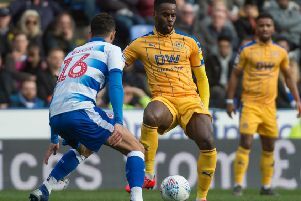 “We identified the players, both playing in the Championship at the moment, who were offered good money for – but unfortunately we couldn’t get them,” he added. “It’s awkward because you have to try and remain selective, albeit at a time where there are emergencies going on in certain positions. “Looking at the signings we did make, they were mostly short-term.